Proprietary Name: Lebody Lab Renewal Dual Effect Hyaluronic Serum What is the Proprietary Name? Lebody Lab Renewal Dual Effect Hyaluronic Serum with NDC 71080-0010 is a a human over the counter drug product labeled by Gtg Wellness Co., Ltd.. 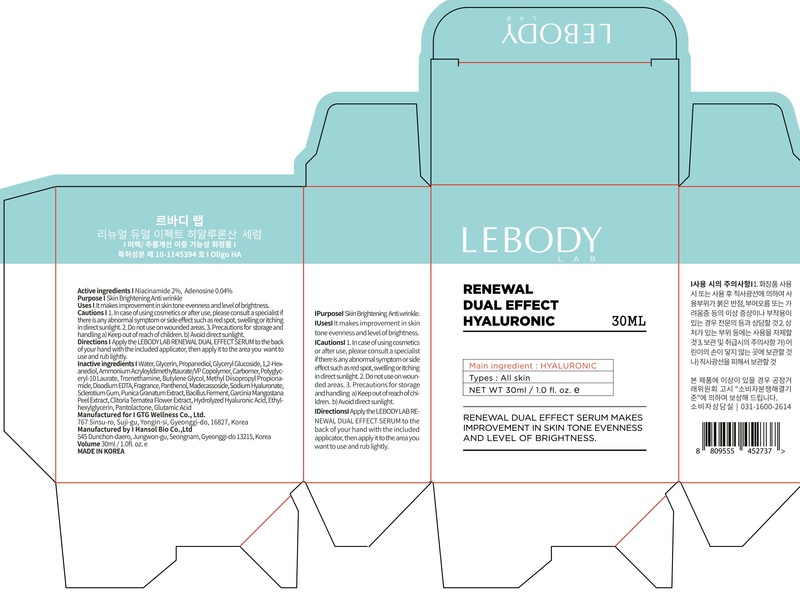 The generic name of Lebody Lab Renewal Dual Effect Hyaluronic Serum is niacinamide, adenosine. The product's dosage form is liquid and is administered via topical form. Directions:Apply the LEBODY LAB RENEWAL DUAL EFFECT HYALURONIC SERUM to the back of your hand with the included applicator, then apply it to the area you want to use and rub lightly.